These layers have not been overturned or folded. Based on that, which layer is the oldest? No. A is on top, which means the other layers had to be there before it could be deposited. A is younger than B and C.
No. By the law of Superposition, layer C had to be in place before B could form on top of it. Layer B is older than A, but younger than C.
Yes! As the bottom layer, the Law of Superposition tells us that it is older than layers A and B. This layer had to be in place before A and B could form on top of it..
No. Layer D is actually a pile of rock fragments, mostly from layer A. 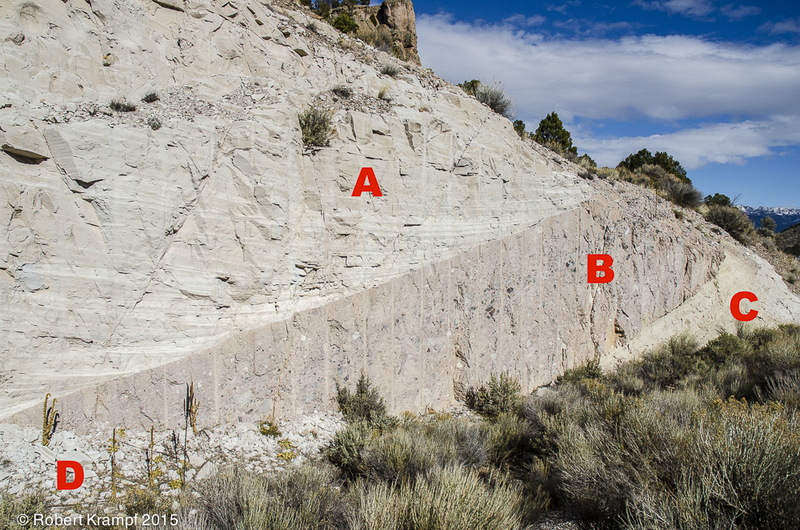 These fragments are the result of weathering and erosion of layers A, B, and C. D is the youngest deposit at this location. UT.8.III.3.c Explain why some sedimentary rock layers may not always appear with youngest rock on top and older rocks below (i.e., folding, faulting).